Nestled deep in the lush green Sahyadri hills, Ellora caves are one of the finest e xamples of rock cut sculptures and architecture in the world. Intricately carved using just a hammer and chisel, these caves are truly an epitome of indian architecture.Build between the 5th and 10th century, the Ellora caves represent the three main religions of that time - Buddhism, Hinduism and Jainism. One of the most important things when you visit a historical site is to get a good guide. We were extremely lucky in this case. Rao Sahib, as we called our Guide was a delightful man of over 60, stooped and bent like a weather beaten tree but seeped in the history and lore of Ellora. We started off from Vishwakarma cave; the most popular Buddhist cave with a magnificent 11 feet high Buddha statue. 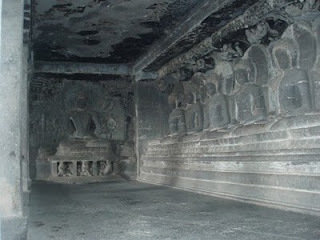 The Buddha statue is at the far end of the cave and is flanked by rows of pillars on both sides. The pan els between the pillars and the roof are very intricately carved from scenes out of Buddha’s life. The most amazing part of the Vishwakarma cave is its roof.The huge dome like ribbed roof seems to be made up of wooden beamS, but has infact been cut out of solid rock to represent beams. This high vault like ceiling is the reason why this cave has the best acoustics. We had people right from guides to fellow tourists shouting and screaming at the top of their voices to prove the power of acoustics in the cave! Rao Sahib was fantastic right from the beginning. He had in depth knowledge about the caves and took us to each panel and pillar to show us the carvings as well as explain the tales that they depicted. In between the knowledge sharing he also acted as our official portrait and photograph taker by obligingly taking our snaps. It was a job that he did with great enthusiasm shouting “Ok ready smile” as we posed before the many sculptures. Surrounded by the many sculptures of gods and goddesses,Rao Sahib also discovered his own mortal apsara amongst o ne of us ! A beautiful carving that caught eye at most of the caves was a Lotus carved not on the panels or walls but on the roof of the cave. Its amazing how the artisans managed to sculpt such a perfect design and that too on the roof. 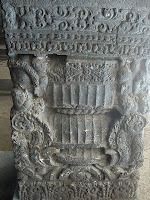 Most of the pillars had intricate designs on them and the most amazing part was that the design was different on each and every pillar. A few pillars inscriptions in an ancient script, most probably prayers. The other Buddhist caves we saw were viharas or monasteries. One thing that struck me was the stark simplicity of these monasteries. Unlike the Vishwakarma cave, here there is no clutter of carvings or sculptures. They are totally Spartan and bare as befitting the lives of the monks who resided there. But what really makes the monasteries stand apart is that they are 3 stories high and have been cut out of the sheer mountain face by human hands using only a hammer and chisel. The pi llars and the corridors inside the monasteries run in precise mathematical symmetry. They are truly a masterpiece of architectural skill. The first two floors consist of living quarters for the monks. But as we wandered up to the third floor we saw a huge Buddha statue flanked by rows of seated Buddhas in various mudras. Here also, there is no other carvings or sculptures except the Buddha statues that seem to be gazing out onto the hills. The whole ambiance was that of total peace and serenity.In the silence that surrounded us, all I had to do was close my eyes and I was instantly transported back hundreds of years. I could almost feel the monks swishing past in their robes murmuring their prayers. 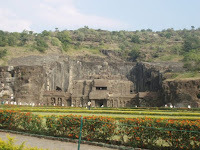 @Srivats - Ellora is simply amazing !The workmanship has to be seen to be believed ! And Ruskin Bond is my absolute favorite writer !